Buy Xiaomi Redmi 4A only at Rs. 5999 on Flash Sale which will start on 23rd March, 12 PM. 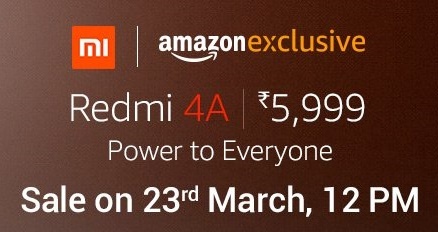 Book Online at Amazon.in, Redmi 4A Specifications, Features, Price. Xiaomi already sold out around thousands of stock Redmi 4A Smartphone in India. It sees the great number of good response from the consumers who recently bought this Amazing Smartphone. In this Specifications, Other Brands Like; Lenovo, HTC, Swipe, Micromax, etc selling this phone at minimum Rs 7-8000. Yeah, as like Redmi Note 4, This smartphone also broke up the whole smartphone market. Just Because At this Price Range, No one Smartphone Industry could give this Beautiful Phone and that's why this smartphone has the black market just because of a huge demand. Amazon.in and Mi.com is the two main sources that you can buy this Smartphone on Flash Sale. The new Redmi 4A is better. faster. and is possibly your best companion for both work and leisure |t packs a Snapdragon 425 64-bit. quad-core processor and an extensive 3120mAh the battery that guarantees you smoother experience throughout the day. Yet it continues light - just 131.59 - and possesses a flat matte finish that feels great in your hands, Beneath the 5 inch HD the display runs MIUI 8, the latest operating system that is the most beautiful and user-friendly operating system Xiaomi presented so far. Apps run smoothly, thanks to the 2GB RAM. The phone allows an internal memory of 16GB and up to 128GB of expandable memory. Xiaomi Redmi 4A has a12.7cm(5")ful1ylaminated display packed with pixels for HD resolution It also has Read mode, which prevents eye fatigue by reducing blue light rays from the screen Colour temperature can also be adjusted based on your preference - warm, standard, or cool. Take gorgeous group photos and scenic shots on the new Xiaomi Redmi 4A. It is equipped With a 13MP camera that captures sharp and crisp photos. MiUI intelligently classifies them based on a date and is even able to detect if it is a panoramic shot or a screenshot. So now you have a handy companion to help you take, edit, and save those memories that are meant to be kept forever. Xiaomi Redmi 4A is powered by the large~capacity 3120mAh battery and coupled with system-level MiUi optimisations, it guarantees up to an average 7-day standby time. So now you can enjoy movie marathons, launch apps, and play games without worrying about running out of battery. Despite its large capacity battery, Xiaomi Redmi 4A stays amazingly slim and light at a mere 131.59. It is housed in a seamless polycarbonate body that boasts a super smooth matte ﬁnish and is to date the lightest in the Redmi series. card for up to 128GB of storage. With the continuous development of smartphone technology. Slightly having the best specifications or hardware is not sufficient for a phone. A great overall experience with perfect synchronisation of hardware and software is sought-after by most users. 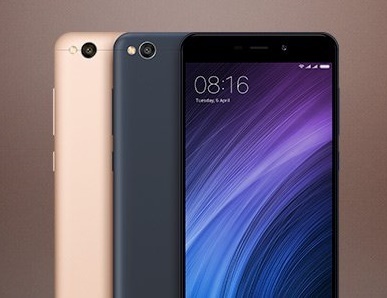 The Redmi 4A by Xiaomi aims to provide its users with a unique experience that combines power and speed in an ultra-light package. Shop online at Amazon.in for the Redmi 4A and experience the next generation of smartphone technology at your fingertips. Featuring a quad-core 64-bit Snapdragon 425 processor under the hood. The Xiaomi Redmi 4A can power through most everyday tasks with ease. This chip also allows you to multitask with several games and apps at the same time without breaking a sweat. Additionally, the Adreno 308 GPU on this processor allows you to enjoy high-end graphics and games in its full high definition glory. Sporting a smooth matte finish over a seamless polycarbonate body. The Redmi 4A is sure to turn heads around wherever you go. Weighing at just 131g in an incredibly slim profile, this phone is the ideal combination of an aesthetical design with practical functionality. At the front, you will find a fully laminated 5-inch HD display that renders vibrant and life-like images. Shop for the Redmi 4A at Amazon.in and experience the pinnacle of technological advancement. With a high-resolution 13-megapixel camera at the back, The Redmi 4A can shoot amazing pictures in all light conditions. Featuring great detail and colour reproduction. You can proudly share images and videos shot using this phone with friends and family and create extraordinary memories. Powered by a high-capacity 3,120 mAh battery, you can use the phone all day long to play games, chat with friends and watch movies without bothering about running out of juice.